What are Actinic Keratosis or Solar Keratosis? What causes Actinic Keratosis or Solar Keratosis? Exposure to UV light (especially UVB) or tanning beds causing proliferation of mutated keratinocytes. Dry , scaly thick, rough patches on sun exposed skin. Can sometimes present as actinic horn. They occur after years of sun exposure and effect both sexes. Mainly on the face, ears, forehead (especially bald men) hands and forearms. Harmless, but we generally treat them as they could potentially become squamous cell carcinoma if left untreated. Avoid cumulative sun exposure, cover up in the heat of the day, daily broad spectrum SPF, avoid being out between 11am-3pm. Not normally needed. This is usually a clinical diagnosis based on history. GPs often prescribe topical cream or use cryotherapy. 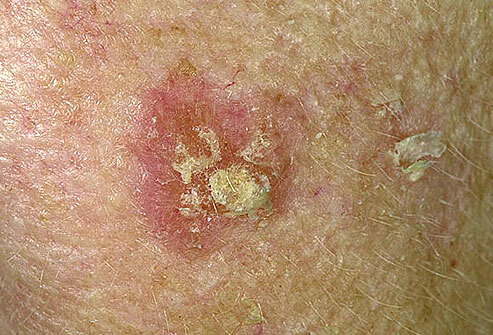 Excellent although Actinic Keratosis or Solar Keratosis can happen again. Daily Sunscreen is a must and sun avoidance. For further information about Actinic Keratosis visit the AAD website.